The First World War was an unprecedented catastrophe that killed millions and set the continent of Europe on the path to further calamity two decades later. But it didn’t come out of nowhere. With the centennial of the outbreak of hostilities coming up in 2014, Erik Sass will be looking back at the lead-up to the war, when seemingly minor moments of friction accumulated until the situation was ready to explode. He'll be covering those events 100 years after they occurred. This is the 83rd installment in the series. The story of the Great War is filled with ironies: the fact that an intricate alliance system meant to keep the peace instead plunged the world into chaos; that decades of military planning left all Europe’s Great Powers completely unprepared for the conflict; that empires which fought to stem the tide of change hurried it instead, bringing about their own collapse. But perhaps the greatest irony of the Great War is that it occurred at a time when the civilized world seemed to have banished war forever. The first years of the 20th century were a time of great optimism, fueled by the undeniable progress of European civilization and belief in science and technology. Disease and malnutrition were in retreat, travel and communication were easier than ever, and Europeans directed the affairs of most of the planet with a patronizing sense of “duty” to the “lesser races.” Amid all these triumphs of “Reason” (frequently capitalized) it wasn’t unreasonable to believe humanity might also be freed from the terrible, irrational suffering and waste of war. This was more than just a hope: It was “proved,” with typical confidence, by social scientists and pundits like Norman Angell, a British economist and member of the Labour Party, who in his book The Great Illusion cited the complex connections between industrial states in areas like trade and finance to argue that a major war would simply be too disruptive to the modern, interdependent global economy. A European war would cut Germany off from British finance, and Britain off from continental markets, leading to total economic collapse; therefore neither country (nor their allies) could afford to start a fight. Kurt Riezler, a German philosopher and diplomat who wielded a great deal of influence as foreign policy advisor to Chancellor Bethmann-Hollweg, argued something similar in his book The Fundamental Features of Contemporary Geopolitics, published in 1914, just prior to the war. Riezler observed that “the world has become a [single] politically unified area,” as nations were drawn together by interlocking economic interests. At the same time, the destructive capacities of modern weaponry meant war would result in “political and financial ruin.” Therefore armed struggle was an “outdated form of conflict"; future wars would instead be “calculated” around a negotiating table, rather than fought out on battlefields, thus sparing everyone the misery of actual bloodshed. Negotiation and compromise were central to Angell and Riezler’s visions of a world without war—and the world seemed to be taking steps in that direction with the creation of new, international institutions dedicated to the peaceful resolution of conflicts. August 28, 1913, saw the opening of the Peace Palace in The Hague, Netherlands, to house some of these promising new institutions. The Peace Palace was built with generous support from Andrew Carnegie, the Scottish-American industrialist, philanthropist and peace activist, as a home for The Permanent Court of Arbitration—an international tribunal agreed in a treaty signed at the First Hague Peace Conference in 1899 (convened at the behest of Tsar Nicholas II with the goal of reducing armaments and preventing war through mediation). Participation in the tribunal was strictly voluntary, so its value was more symbolic than anything else—but in an idealistic age, this still mattered. A bit weirdly, the Palace was originally supposed to be the central feature of “city of world peace,” a sort of proto-world capital, sketched out for the beach near The Hague by the Dutch spiritualist and pacifist Paul Horrix; the somewhat impractical design produced for Horrix by the architect K.P.C. de Bazel, but never built, called for a circular city with streets radiating out from the Peace Palace at the center. At Carnegie’s insistence, the Peace Palace was also home to an extensive library of international law. Meanwhile several more international courts were proposed at the Second Peace Conference in 1907 but never agreed upon; the war intervened before the Third Peace Conference, scheduled for 1915, could take place. 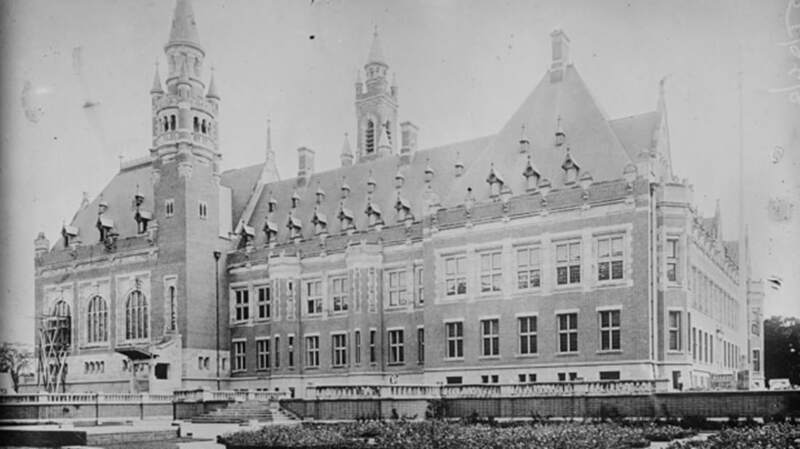 In subsequent years the Peace Palace also became home to the League of Nations’ Permanent Court of International Justice, added in 1922; the Hague Academy of International Law, added in 1923; and the International Court of Justice, formed by the United Nations to replace the Permanent Court of International Justice in 1946. But as demonstrated by the rocky history of these institutions, the vision of a world ruled by Reason, with peace maintained by international institutions, remains more a dream than anything else. Despite a lukewarm suggestion from Tsar Nicholas II, the Peace Palace sat unused during the July Crisis of 1914; after the First World War the League of Nations was most notable for its failure to prevent the Second; and the United Nations has for the most part proved sadly impotent in the face of wars, civil wars, and genocide. The international rules of war, agreed to at The Hague Peace Conference in 1899, have also been routinely flouted.